You know, when Spider-Man swings across a cover with a crook in tow he doesn’t use a sleeper hold. This review is going to be a bit different and I’ll be using a format I used to use for multiple story comics, like the Holiday specials. In celebration of Batman’s 75th (which DC is celebrating on time, possibly because there’s no movie this year like Superman for HIS 75th) and because I only seem to have one issue of the comic I reviewed in the DC Monday slot last week, I thought we could take a look at the comic that started it all, the debut of Batman. As you can see from the cover scan on the left I using the “Millennium Edition” reprint from February, 2000. It holds not only the Batman story but other stories (back in the day there were other anthology titles, including Action Comics, which debuted Superman and Fawcett Publishing Whiz Comics, the debut of Captain Marvel) which we will also take a look at to see if, in the tradition of Slay Monstrobot Of The Deep, these characters could have been brought back or even continued on in the DC Universe. The first story, at least in the reprint because I don’t know what the order was in the original printing, is the one most of you care about. (WRITER: Bill Finger; ARTIST/CREATOR: Bob Kane) And no, I’m not getting into that debate. That’s what’s written in the comic, although Finger’s credit was in the reprint’s credits section. Socialite Bruce Wayne is hanging around Commissioner Gordon’s house when Gordon receives a call about a murder and invites his friend to tag along. (Boy, crime scenes were different in the 30’s.) A friend of the man receives the same death threat the current victim received and while the criminals kill him as well, they’re met by the “Bat-Man” (that’s how it’s written most of the time) who manages to save the final victim and cover the reason for the murders. There are a lot of differences. When the “Bat-Man” punches the villain and he falls into a tank of acid that happens to be there for some reason his response is “A fitting ending for his kind”. That’s pretty cold, the “Bat-Man”. You can see most of his classic outfit except the cape isn’t nearly as cool as it would become (not quite “best cape in comics” level) and the ears point on an angle. It’s still an interesting story, as the “Bat-Man” shows some decent detective work but there is a big difference from the Batman we know and love today. The Killers Of Kurdistan is a secret society of assassins and police detective Speed Saunders finds one of his victims. Saunders goes to see an old friend about the mark left on the body and soon uncovers the perpetrator. It’s a pretty good detective story for the space, and his solution is clever, although Saunders’ hair changes color when he isn’t wearing his hat. Was that an original error or this reprinting I wonder? In the old west, Buck and the Sheriff investigate a dead ranch owner, but the “Terror” has a similar motivation to the operation Saunders dealt with. Where this stands out is we get to see more of Buck doing actual detective work in finding where the rancher was actually shot. Also for some reason the whole comic isn’t in color except for shades of red. There is another story in this comic like that, and I have to wonder if that was intentional or if the reprinters couldn’t find a color copy of those pages. There’s also something that bugs me in some comics from this time, where the caption boxed are at the bottom of the panel but if read correctly should be on the top. I never understood why they did that. Still, it’s the most “detective” of the detective stories in this issue. Bart Regan, government spy, investigates the strange deaths of councilmen on the un-American activities investigation committee. There isn’t a lot of detective work, but Bart’s a spy, not a detective. He is also really into his job, according to the last panel comment “that’s old stuff–bring on another case!”. It’s a decent mystery and shows that Siegel & Shuster could write more than superstrong aliens. I’m not sure why they call him “The Crimson Avenger” in the title when he’s just called “The Crimson” in the story itself. Stop me if you’ve heard this one. A publisher, aided by his Asian manservant (in this case Chinese) fight crime while being hunted by the police. Unlike the Green Hornet, however, the Crimson doesn’t appear to fake being a criminal himself while investigating some rather public killings. I’m not sure if you’d consider the Crimson a pulp hero like the Shadow or a superhero with pulp elements like the “Bat-Man” but it’s interesting to see a second costumed crimefighter in this comic who may actually predate Batman. The obligatory text story sees detective Captain Richard Byrne looking into a series of murders at a radio studio with no visible means of killing. the murder method would work in a Scooby-Doo episode, if murder took place in the Scooby Universe, but is rather ingenious well before the cartoon would even be an idea. Another good story. Nelson goes to visit a detective friend while checking out New Orleans at Mardi Gras, and gets caught up in an investigation of an apparent voodoo witch. It’s interesting to see voodoo being taken seriously as it’s actually performed and not writing it off as superstition, especially in a comic from the 1930s. However, the story ends on a cliffhanger so unless someone out there knows what happens in Detective Comics #28, I’ll never know how this story ends. I’d be surprised if DC reprints anything other than the Batman/”Bat-Man” story. The Mysterious Doctor Fu Manchu! Done in an illustrated rather than comic style (the only modern counterpart I can point to is the Prince Valiant newspaper strips), it seems to be a continuing adaptation. Dr. Petrie is part of a group trying to convince a reverend not to return to China because it’s too dangerous at this time. Strange goings on are taking place at the manor they’re in and it may be connected to whatever orders Dr. Fu Manchu is following. (A bit different from what I hear about him in the pages of Master Of Kung-Fu.) Modern readers will be put off by Chinese people colored all in yellow and the book may have more unintentional racism in its’ pages but there’s an interesting story here otherwise. Another one-page comedy, although at least Paul Gustavson’s Flatfoot Flannigan is a cop. Who can’t seem to drive a decent car chase. Another story in shades of red..which means the Chinese guys aren’t going to be yellow at least. But don’t worry, the dialog makes up for it when Cosmo (don’t know if that’s his first or last name) investigates a Chinese immigrant smuggling operation. This one is easily ruined by time, mostly when the Chinese guys replace all of their “R”s with “L”s. I do give DC credit for including this story to be complete but even I was put off by this one, and I usually write some of this kind of thing off as the results of the time period and how little they knew about other lands compared to today as well as cultural changes in both our countries. Pete and his partner track down a missing criminal. There are a number of reasons why this is the weaker story even by the time period’s standards. The worse one for me is I couldn’t tell what accent they wuz tryin’ ta give the characters. For another it’s less detective work and more getting lucky hunches with no real clues. I wasn’t bothered by the more cartoony art style but as a more serious story (unlike Tenderfoot or Flatfoot Flannigan) it does stand out. (Jerry Siegel & Joe Shuster) I couldn’t tell you if they switch duties from Spy. Slam and his sidekick, Shorty Moe, make friends with a G-Man they rescue from a bad guy. When the villain escapes, the G-Man goes after him in Switzerland and disappears. Slam and Moe go to investigate. There is a problem with the word balloons sometimes being out of place but otherwise it was a good story. 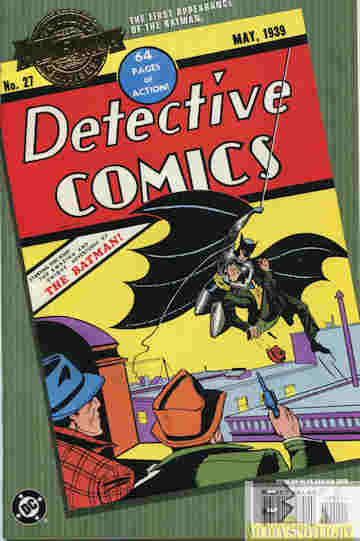 Detective Comics #27 is known for the Batman debut as he would go on to be the breakout character of the comic and would achieve a high point in the DC Universe. However, I would recommend trying to find a reprint of the full comic and not just that story. Mild and not-so-mild racism and one just altogether bad story doesn’t ruin the rest of the comic and there are some good stories for fans of crime drama and pulp heroes. Posted by ShadowWing Tronix on March 31, 2014 in DC Spotlight, Yesterday's Comics and tagged Batman, Crimson Avenger, DC Comics, Detective Comics, Slam Bradley, Speed Saunders.